The Wes Leonard Heart Team has given away over 70 AEDs to schools since August of 2011 and continues to make saving lives a priority. AED.com is honored to help them continue their goal of equipping all schools with AEDs. Thank you AED.com for helping us donate an AED. With every AED we donate, it helps save lives in Wes’ memory. Ms. Flores and the Wes Leonard Heart Team work tirelessly to push for state legislature that will require AEDs in schools and strive to increase awareness about Sudden Cardiac Arrest and the cure that comes in the form of an AED. Ms. Flores commented that, “It’s been over 20 years between the death of the famous basketball star Hank Gathers and Wes’ death and nothing has changed in terms of legislation in Michigan. No one knows about Sudden Cardiac Arrest and it’s killing our kids on a daily basis.” AED.com commends the West Leonard Heart Team for their passionate efforts and hopes that more organizations will utilize similar methods and continue to increase AED awareness. In an effort to do their part in training individuals, AED.com offers Free Web Training with the purchase of every AED. “We hope, in addition to selling our customers a lifesaving device, to equip them to be ready to face any unexpected events. Training with our representatives’ helps to familiarize the customers (staff members, community members, etc) with the device, so in the event of an emergency they are ready to spring into action,” commented Kristin Rudolph, AED.com Sales Support Representative. Sudden Cardiac Arrest kills 325,000 people of all ages every year. AED.com and organizations like the Wes Leonard Heart Team work hard to decrease this statistic and see more lives saved. For more information or to donate to the Wes Leonard Heart Team please visit http://www.wesleonardheartteam.org/wes-leonard-heart-foundation/. For more information about AED.com, please visit: http://www.aed.com/. 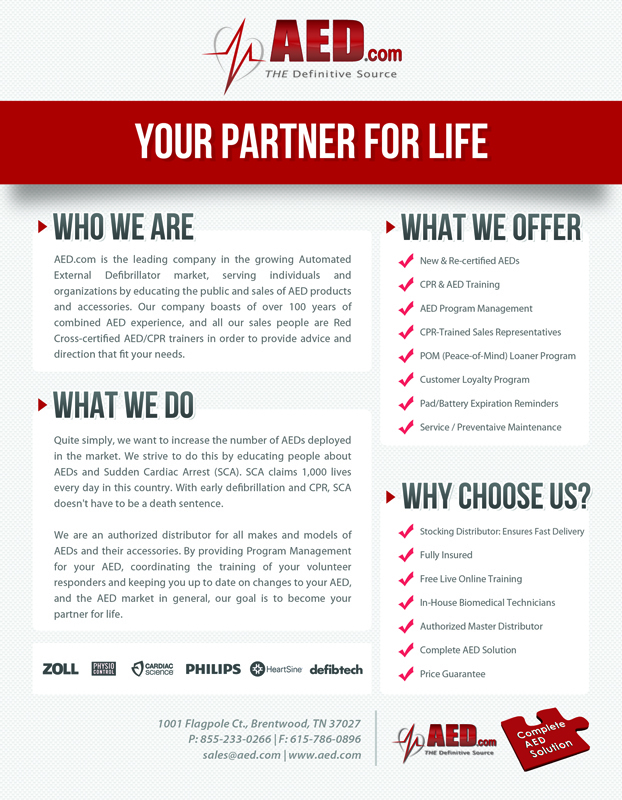 AED.com is headquartered in Brentwood, TN and services over 20,000 customers in all 50 states and 35 countries worldwide.